(Mar. 5, 2016) — See the Three Legged Stool Test for “natural born Citizen” of the United States to Constitutional Standards as It Applies to Who Can be President and Commander-in-Chief of Our Military. Marco Rubio was born to a Cuban Citizen father (minus one leg) and to a Cuban Citizen mother (minus the 2nd leg). For a Printable PDF File of the Details Click Here. Marco Rubio was a basic “Citizen” at birth of the United States by being born in Miami FL. But he was also a Cuban “Citizen” at birth via inheriting Cuban citizenship via Jus Sanguinis laws recognized by the U.S. and Cuba from his Cuban foreign national alien parents. He was born a dual-Citizen of Cuba and the U.S. with divided allegiances at birth. He was born with “foreign influence” on him at and by birth which the founders and framers did NOT want for future Commander in Chiefs of our military forces. He is NOT a “natural born Citizen” to constitutional standards. Adjectives mean something! The adjectives “natural born” before the word/noun “Citizen” mean something! Marco Rubio is definitely NOT constitutionally eligible and is pushing the presidential eligibility envelope, meaning, and originalism understanding of that constitutional term far beyond what the founders and framers understood “natural born Citizen” to mean when they chose that term for who could be the President and Commander in Chief of our military once the founding generation was passed. A “natural born Citizen” of the United States is a child born with Undivided and Sole Allegiance and Unity of Citizenship at birth to one and only one country — the USA, i.e., a child born in the USA of two (2) U.S. Citizens. The parents can be Citizens by Birth or they can be Citizens by Naturalization later in life after immigrating to the USA. But to create a “natural born Citizen” of the United States both parents must be Citizens at the time the child is born in the USA. See this legal reference book used by the founders and framers of our Constitution: Law of Nations or Principles of Natural Law, Vol.1 Chapter 19 Section 212, Emer de Vattel, 1758-1797. The overwhelming majority (probably 85%+) of citizens in the United States are natural born Citizens. This clause was added for future presidents as a national security clause. 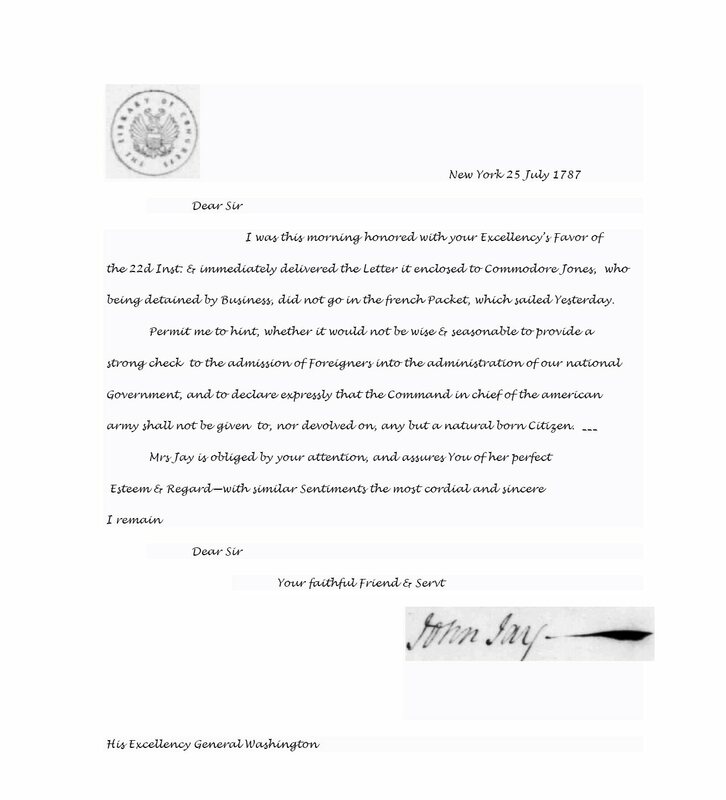 It is from the group of natural born Citizens that our founders prescribed in the presidential eligibility clause in Clause 5, Section 1 of Article II of the U.S. Constitution that we shall choose a President and Commander in Chief of our military as a strong check against foreign influence via birth allegiances on the person in that singular and most powerful office. One needs all three citizenship legs to be a natural born Citizen and have sole allegiance and claim on you at birth to one and only one country — the United States: 1. Born in the USA. 2. Father must be a U.S. Citizen (born or naturalized). 3. Mother must be U.S. Citizen (born or naturalized). Like a three legged stool if you take away any of these three citizenship legs of the Article II constitutional intent and requirement to being a natural born Citizen, i.e., being born with unity of citizenship in and sole allegiance to the USA, the child is born with more than one country’s citizenship and claim of allegiance/citizenship on them at their birth and thus they are NOT a natural born Citizen of the United States. 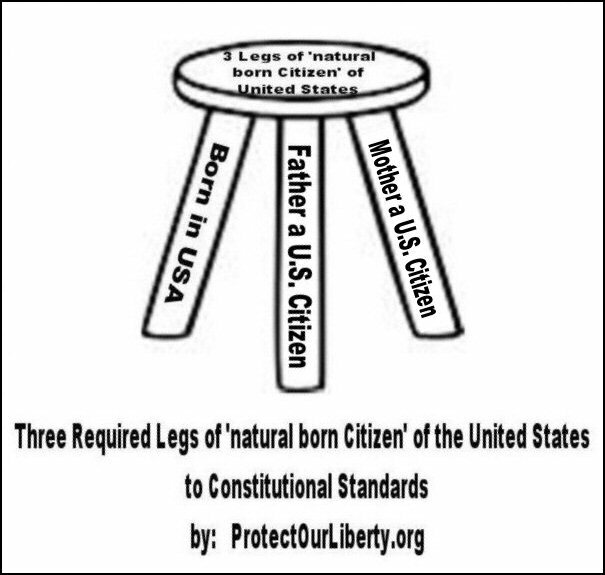 In this test and analogy of a stool designed to stand on three legs and if it is missing a leg, it falls down, likewise the person’s claim to ‘natural born Citizenship’ fails if the person does not have all three citizenship legs required to be a natural born Citizen at the time of their birth. See the below Venn Diagram which logically and graphically shows how a natural born Citizen has the intersection and unity of all three Citizenship statuses at birth. Read this essay “ Of Trees and Plants” on basic logic which explains that being simply a “Citizen at Birth (CAB)” does not necessarily make oneself a “natural born Citizen (NBC) at Birth”. Natural born Citizens are overwhelmingly the largest subset of all American citizens. The location of birth being in the U.S. to a U.S. father and U.S. mother … all being U.S. Citizens at the time of birth is the only way one achieves natural born Citizenship status. Who is Natural Born, Who is Not? Who is a ‘natural born Citizen of the United States’ to Constitutional Standards? One Response to "Marco Rubio is Missing Two Legs! – He Cannot Constitutionally Stand for President or Vice-President – He Fails The Three Legged Stool Test for “Natural Born Citizen“"
He is an Anchor Baby!!!!!!!!!!!! !